Poor TV reception is always annoying. It can be a combination of one or more problems from anywhere between your antenna to your TV. So why put up with it? With well over 14 years experience in the TV antenna industry, we only use the appropriate test equipment to locate the problem. We know what works and what won’t, so why trust anybody else. Your masthead amplifier (if you have one). The lead from the TV outlet to your TV. Has as any trees grown or is there a large amount of foliage on a tree near by? Are there any hills in the way of the TV reception? Picture freezing with square boxes (pixelation). One outlet working fine but others are not working at all. Your current TV antenna is falling apart, which will become a safety hazard. 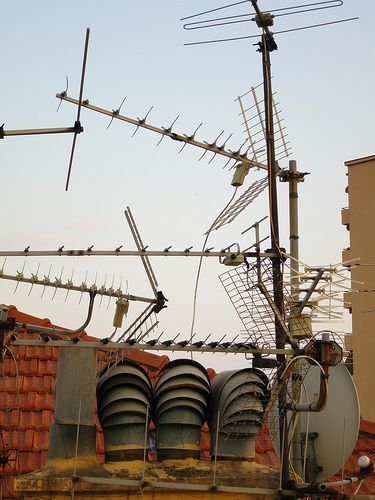 If you are experiencing any of these issues, having your TV antenna system looked and repaired right the first time is essential, only then will you be receiving picture perfect reception. We perform a full array services from TV antenna repairs to TV outlet installations, pre-wire new buildings to old antenna mast removals. No matter what your TV antenna issue is or the size of the job, we can solve it for you with little interruption to you. From domestic to commercial as well as industrial sites, we also do insurance work as well. 95% of the time we can fix any problem on the spot, so there is no need to miss that movie on the big screen tonight. Some of the equipment we will use are listed below. A list of TV Antennas we use. A list of Filters, Splitters and Brackets we use. For poor TV reception, Television Amplifiers we use. For Commercial Site, this is some of the equipment we use. We only use high-quality TV antenna products to ensure many years of perfect interference-free reception for you. We also offer 15% pensioners discount on all our jobs. A service call starts from $95; it includes a service call as well as the first 30 min on site. We are the leading TV antenna installation company in the Newcastle and Lake Macquarie areas through our blogs and photo of our previous installations. As a result, a company policy we hold is, if we are not able to fix the problem and we do not have a solution for you, we will not charge you at all, we offer a full 2-year warranty on all our work. We service Newcastle, Lake Macquarie, the Hunter, Salamander Bay, Maitland, Kurri Kurri, Cessnock & all surrounding areas. We accept cash, cheque, credit card and eftpos for your convenience.